Manaslu Adventure Treks is managed and run by a team of energetic, dynamic and dedicated professionals with decades of experience in the fields. Manaslu Adventure Treks for that superior experience in Trekking, rafting, Wildlife Safari, Sightseeing and Hotel Reservations. We also organize trips to the equally mystical lands of Tibet (Mt. Kailash), Bhutan, India and Pakistan. Welcome to Manaslu Adventure Treks to Nepal !! Manaslu Adventure Treks (Pvt.) Ltd. is a professional company specialized in handling treks and tours in Nepal. Manaslu is managed and run by a team of energetic, dynamic and dedicated professionals with decades of experience in the fields. At Manaslu Adventure Treks, we keep in mind that holidays are supposed to be hassle free, so all your travel needs are taken care of in the best way possible. You can rely on our in-depth knowledge of the country, which ensures a high quality travel arrangement. We are a strong follower of sound environmental practices and promote Eco- friendly treks and expeditions. Quality is the watchword of our organization and we always strive to provide our customers with a truly memorable experience. Remember Manaslu Adventure Treks for that superior experience in Trekking, rafting, Wildlife Safari, Sightseeing and Hotel Reservations. We also organize trips to the equally mystical lands of Tibet (Mt. Kailash), Bhutan, India and Pakistan. We have office and representative in Europe as well. Trekking in Nepal is not only the objective of walking from place to place, it is more a gradual way of experiencing Nepal’s diversity in terms of geography, peoples, religion & it’s art & culture. In earlier time to be a trekker & to complete the route you planned was not easy work because there were not the good trails we have these days. With the 10 highest peaks in the world, including Mt. Everest, which crowns this country. Nothing on earth can beat the exhilaration of scaling these peaks. 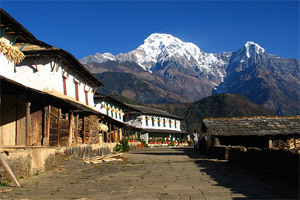 Nepal is the favorite destination for mountaineers everywhere. The high Himalayas with its glaciers make Nepal a river runner's paradise. Nepal is full of beautiful rivers, which all originate from the beautiful Himalayas in the north and flow all south to the lowland plains. We are a strong follower of sound environmental practices and promote Eco- friendly treks and expeditions. Quality is the watchword of our organization and we always strive to provide our customers with a truly memorable experience. The Terai plain offers lustful green forests, which is the home to a large variety of wildlife and birds. Wildlife camps scattered throughout the country offer lifetime opportunities for watching animals and birds in their natural habitat. Nepal is the most beautiful and stunning Himalayan country in the world. Though small in size, it is known in the world as a nation of color and contrasts-a hidden Shangri-La of nature, culture and adventure. In the countryside the way of life is still traditional, nature is at its best, high mountains and lush valleys are ideal places. Saint Patanjali is a Great name of the eastern philosophy who invented the great science of "Yoga and Meditation" hence the world renowned "Patanjali Yoga" is this. The yoga here meant a unity of things - unity of mind, body and soul.